According to the EPA, the key to mold control is moisture control. 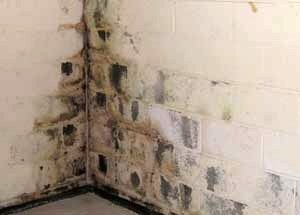 Molds grow in wet, dark environments and can cause a range of health problems. A relative humidity level of greater than 55% promotes the growth of mold and other fungi. Many mold problems originate from water and pipe leaks because these leaks often go undetected for days, months, or even years. Mold is prominent in basements and crawl spaces because they tend to receive less ventilation, and are more likely to be neglected than other parts of the home. While there are hundreds of different types of mold, the various molds are organized into three groups according to human responses: Allergenic, Pathogenic, and Toxigenic. Allergenic molds are not life-threatening. They will most likely affect those who are already allergic or asthmatic. Pathogenic molds usually produce some type of infection and can cause serious health effects in people with immune disorders. Toxigenic molds can cause serious health effects in almost anybody. These molds have toxic effects ranging from short-term irritation to immune-suppression disorders and even cancer. It is important to remove all types of mold and mildew. It is important to clean the mold and fix the water problem.